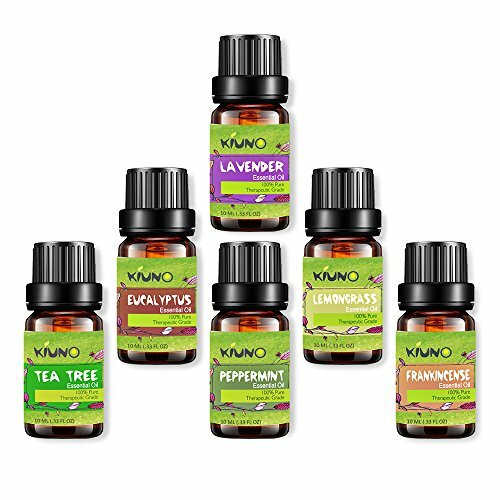 This Essential Oil set includes Top 6 essential oils. All our oils are 100% pure natural oils extracted from plants. Essential oils are obtained by distillation and having the characteristic fragrance of the plant or other source from which it is extracted from.erfect sampler set for beginners to the essential oil world. Frankincense Essential Oil: Fights fatigue, helps heal eczema, psoriasis and dandruff. Lavender Essential Oil:Helps heal minor burns, cuts, insect bites, eczema, dry skin. Soothes anxiety. Tea Tree Essential Oil:Helps heal eczema and psoriasis, boosts metabolism. Peppermint Essential Oil: calms indigestion, relieves sinus congestion and headaches. Eucalyptus Essential Oil: Helps relieve cold and flu symptoms, fights dandruff. Lemongrass Essential Oil: Fights bacteria, deodorizes. Fragrance soothes anxiety and depression. 1. The oils can be added to your bath tub for an aromatic, healing, stimulating and energizing bath. 2.Few drops of oil can be added to potpourris, vaporizers, candles or diffusers for combating germs in the air and protecting the environment naturally. 3.can be diluted with carrier oils and used as a topical application or for a relaxing Ayurvedic massage. SAFETY WARNING: For external use only. Other than aromatherapy, dilute with a carrier oil. For topical use, rub a very small amount on the inside of your elbow area to test for any allergic reaction before use. Discontinue use if uncomfortable or if irritation occurs. Keep out of the reach of pets; Cats can be especially sensitive to essential oils. Avoid contact with eyes, keep out of the reach of children. TOP Quality Aromatherapy Essential Oils Gift setºincludes Six (6) 10 ml bottles of our most popular essential oils - lavender essential oil,eucalyptus essential oil, peppermint essential oil,lemongrass essential oil,tea tree essential oil,Frankincense essential oils. Pure and Therapeutic Grade Essential Oils: No additives, fillers, bases or carriers added.All ingredients meet art natural standards, paraben free and cruelty free. Great Scent and Premium Grade Fragrance oils: Our Essential oils are highly concentrated from plants.We use steam distillation for extraction making sure the rich pant aroma remains intact.Each essential oil in this set has its own special therapeutic benefit. Calm down anxiety, repel bugs, clear skin complexion, boost immune system, purify air, treat insomnia, relieve joint and muscle pain and more with this set. Aromatherapy Essential Diffuser Oils :The Essential Oils can be used with compatible aroma diffusers or many humidifiers, by adding a few drops of oil combined with water the diffusers & humidifiers at home, work or car for tension and stress relief will release a scented vapor into the atmosphere. Aromatherapy & Relaxation Oils Usage:Essential oils are a healthy and natural way to help with relaxation. Can use as Aromatherapy Oils, Custom Massage and Body Oils, Vaporizer, Diffusion, Oil Burner, Spa and Home Care, Cleaning Products. If you have any questions about this product by KIUNO, contact us by completing and submitting the form below. If you are looking for a specif part number, please include it with your message.